ANDOVER – Looking for a great date night suggestion for you and your spouse or just a way to spend time with friends? (From April 12 edition). Mark your calendars as Andover Community Theater Society (ACTS) is in the process of preparing a murder mystery dinner theater for adults over the age of 18 on Saturday, April 27, titled “Fatal Football Fever” as written by Paula Hilton. According to Adult Programming Coordinator Sheila Privett and Director Betsy Paul, the dinner theater will begin at 7:30 p.m., with doors opening at 7 p.m. at Andover Public Library for a fee of $30 a person ahead. As noted by Director Betsy Paul, the play itself will center on the prominent residents of a small town who are all interested in owning a brand new professional football team for various reasons. Cast members include Sam Frush as Dan SeAnsee, Lynnette McCowein as Nancy Ann SeAnsee, Floyd Huff as Heathro Ancatch, Venie Hinson as Les Abelle, Wendy Frush as Jesse Abelle, Betsy Paul as Paula Tishen, along with Dana Heckathorn as Andre Pennewer. Meal-wise, Privett said participants will be offered a variety of menu choices between acts, including an appetizer, salad, ham or roast beef, parsley potatoes, green beans, rolls and butter, beverages and a dessert through catering from Scooters by the Lake. The grand prize for solving the mystery is a $50 Scooter’s by the Lake gift card, along with a new mystery book donated by the Friends of the Library. Proceeds from the event will benefit Andover Public Library. For further information about purchasing tickets or about the murder mystery dinner itself, please contact Betsy Paul or anyone at Andover Public Library. 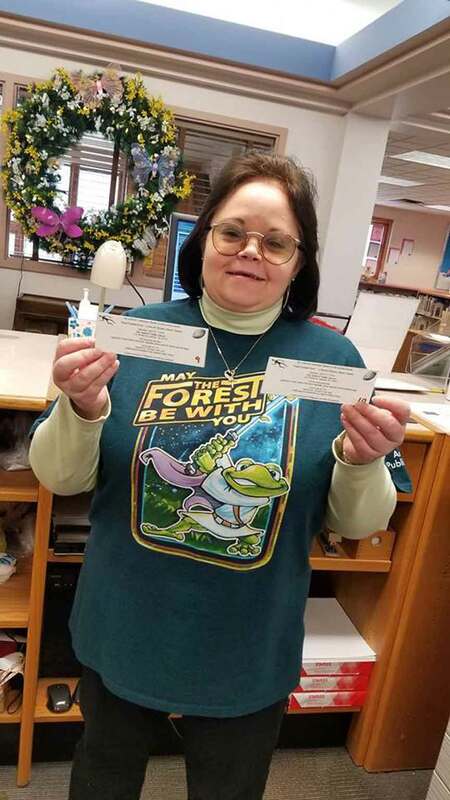 Pictured: Director Betsy Paul holds up a few tickets for ACTS’ spring murder mystery dinner theater event as set this year for Saturday, April 27, within Andover Public Library.